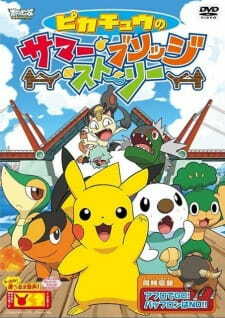 Satoshi (Ash)'s Pikachu and friends visit a town with a huge draw bridge, but problems arise when they come across Satoshi's Mijumaru (Oshawott) and Pokabu (Tepig), who have eaten the fruits that wild Gothimu (Gothita) and Darumakka had collected. They head off to collect fruits from the forest across the bridge, but then Nyarth (Meowth) appears and tries to steal the fruits. On top of that, the bridge is raised, blocking their passage. What will Pikachu do? The fight for the fruits begins! !